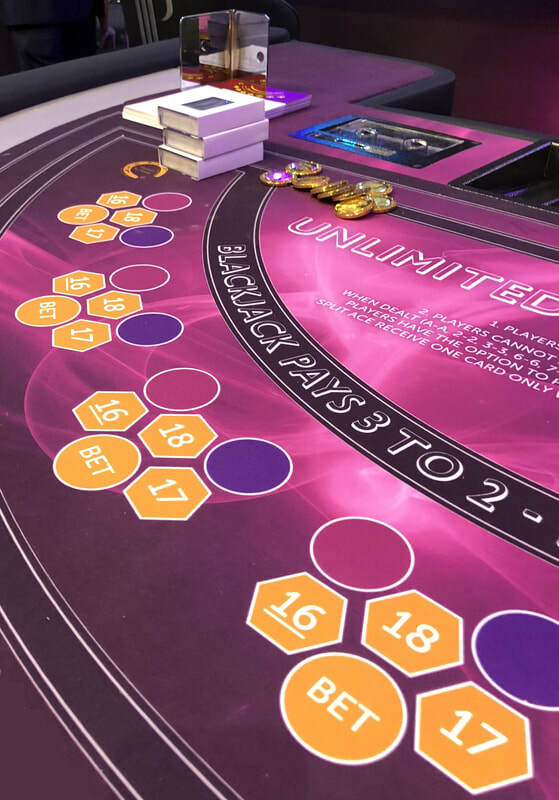 Unlimited® Blackjack-TURBO™ can be played by an unlimited number of Players at the same time. Due to this, the game rules vary from those of the Standard Blackjack. No-Split-Pairs, Top-card of certain Pairs will Swap with a New-card. Player's Pairs of 2's, 3's, 6's, 7's, 8's, and Aces will be Top-Swap (Top-card Swap with a New-card) Automatically. All other Pairs are never Top-Swap or split. Player may draw to Ace with a Top-Swap. Ace with a Top-Swap ten-value card makes 21 not Blackjack. Unlimited® Blackjack-TURBO™ is a First and a New-Way to Play Blackjack. * Use Top-Swap  when Splitting Pairs. * For land-Based Casinos, Player's hand value is Recorded using the Blackjack-Grid. * One Common Players-Hand is dealt, which all Players share. Each Player makes their own play decisions. * No card will be drawn until all Players have made their Play decisions. 2. Unlimited® Blackjack™ Auto-Splits® (Turbo-19).